Summer is only one week away! School is out and Sarah's graduation went very well (I'll be posting on her graduation very soon). The garden is a little slow to start this season, the weather is a bit back and forth, but in between cool and rainy days we have been getting a little heat that I am hoping will spur some growth of our veggies. Here is what is going on in the garden this week. The star of the garden this week - my little potato patch. This week two of the potato bags have blossoms! All of the potato plants are doing well, in the next week or so I will check them from the side velcro flap on the potato bags and see if there are any small potatoes to try. Quite a few of the seeds I planted this year had trouble with germination- you can see the spotty germination of my green beans, I have planted more in the gaps in hopes that I can get the bed filled in more. I had this trouble last year too, and had to replant the whole bed, so I was glad I had some germination this year. I may have to try a different variety next year. Here is my bed of "purple" green beans, better germination, but still a few empty spots, the garlic in the back is doing well, and little tiny leeks are up next to the garlic as well. My worst germination issue is with my Zucchini patch, Out of roughly 50 planted seeds this is all that came up! I wrote to Burpee and they sent me replacement seeds so I can try again, I just got them in today, so fingers crossed that they germinate and then catch up. For now my zucchini hopes are all on these few little plants! My black radish plants are doing well, they have all come up, and I have thinned them a bit. It does look like some little critter has been snacking on the leaves, I am hoping they will leave me a few! It may be time to pull out the insecticidal soap, I don't like using chemicals in my garden, but last year I did find a brand that is supposed to be safe and for use in organic gardens. I planted two pots of basil, the standard variety did not germinate, and I am replanting it, but the purple variety is doing well, look at the cute tiny little purple basil leaves! I will be excited to see how they turn out! The green onions are doing well. I love cooking with green onions, and it is so nice to be able to walk right outside to get them instead of running to the grocery store. The corn variety I was growing in my tubs- Burpee's On Deck variety, made for growing in small gardens, also had germination issues, unfortunately they were all sold out, so I couldn't get replacements, out of the whole seed packet only 3 little plants germinated, so I may decide to grow a standard variety just for fun. We really had a lot of germination issues this year, more than ever. I may have to experiment with different seeds next year. What is your favorite seed brand? I spotted a volunteer nasturtium, which I was glad to find since I didn't plant any this year. The lettuce is doing beautifully, I am hoping it gets a little bit bigger, but otherwise it is ready to start using. 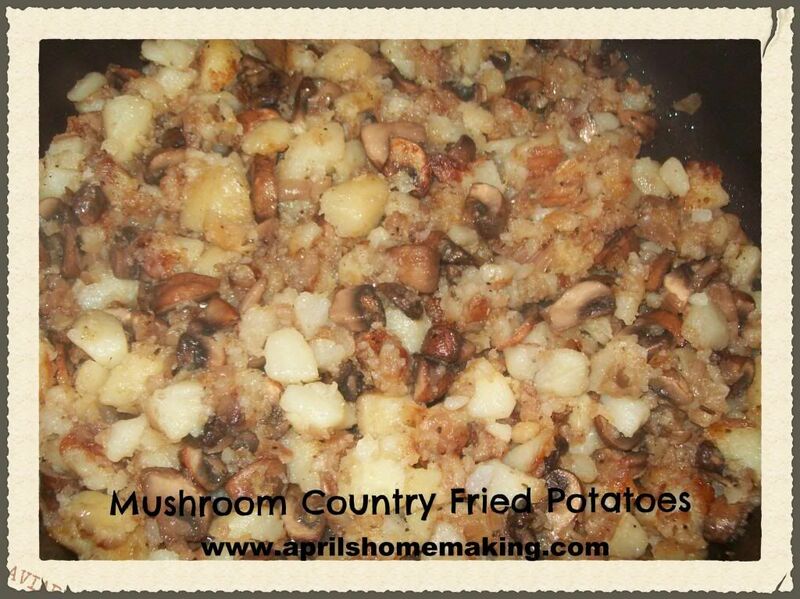 This last week I made a yummy side dish that the whole family enjoyed, and featured one of our favorites- Mushrooms. Here's how I made it. Cut up one red or white onion ( I had red on hand), and saute in a little olive oil. When onions have begun to turn translucent, add chopped mushrooms. I used Mini Portobello mushrooms, but you could use standard white mushrooms, or crimini, or a mixture. I used about two packs worth of mushrooms for four servings, adjust how much you use based on how many you are serving. I also added a few dashes of Italian herbs, I love rosemary and thyme with mushrooms. Add a little more olive oil if needed. Saute until mushrooms have cooked down and liquid from mushrooms has cooked down. With a slotted spoon transfer mixture to a bowl, and set aside while potatoes begin cooking. To the same pan you used to cook mushrooms and onions, add enough olive oil to fry potatoes, not too much though or they will be greasy, it really differs based on the starchiness of the potato. Cut up precooked and cooled pealed potatoes into bite sized pieces, I used four large russets, but any variety will do. I always cook extra potatoes to keep in the fridge for breakfast or quick dinner side dishes, I will often cook up the whole bag and keep them in the fridge, that way you only have to turn on the oven once, and you have potatoes for the week. Fry up the potatoes just like you would hash browns, add salt and pepper to taste, we love lots of fresh cracked pepper, add some more Italian herbs if desired, cook until they have a nice golden brown color. Then add back in the mushroom onion mixture and cook until everything is combined and heated through. Serve along side your breakfast, or with sausages for dinner, this also would make a wonderful Vegan main dish that could be served along with some steamed greens or a salad for a nice Vegan/Vegetarian alternative. The mushrooms really give the potatoes a hearty flavor. I hope my garden will look as good as yours when I've sorted it all out (which is likely to be next year) Odd, though, you only had those couple of courgette plants. Too cold maybe? Still, two should give a reasonable yield. Happy Eating! I had a lot of germination problems this year also, April. We are having the same type of weather here also, cold and rainy with an occasional hot day. Maybe that's the problem. We had to replant the carrots, but they came up the second time and are lettuce and beans were sparse. Potatoes are lovin' the weather though! Guess it's good for some things and bad for others. Vicki~ Yes, I was very happy when Burpee said they would replace my seeds free of charge, they really stood behind their 100 percent guarantee. :) I am really enjoying my potatoes as well! Thanks for stopping by, hope you are all having a great week! Hey April! How did you get the "pin it" button on your post? Just wondering. Your potato bags are looking fantastic! Mine are really taking off too. I'm looking forward to seeing how the harvest goes!